A gap to close captures the main ideas evident in the literature on the relationship between health, waste management, and Aboriginal and Torres Strait Islanders living in rural and remote Australia (hereafter Indigenous Australians). The report represents the most comprehensive account on the theme to date. 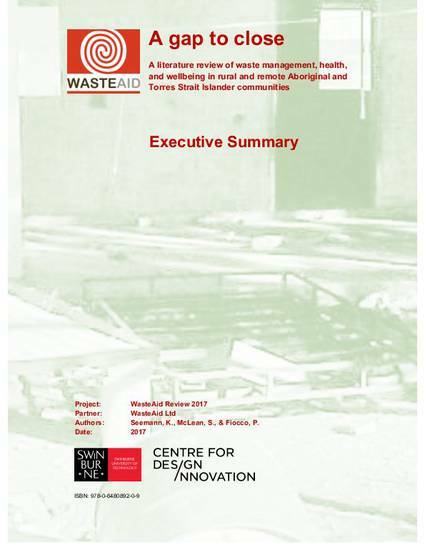 Modest information on the relationship between waste- and health in remote communities was captured in the recent “Closing The Gap” Report. Our report offers a complementary account of waste and the gap of knowledge we have identified for guiding future policy and improvement to the quality of life in communities as it relates to place- based solutions, and policy development, for improving health and wellbeing. Seemann, K. McLean, S. and Fiocco, P. (2017) A gap to close: A literature review of waste management, health, and wellbeing in rural and remote Aboriginal and Torres Strait Islander communities. Swinburne University of Technology, and Waste Aid Australia Ltd. Melbourne.